Not satisfied with providing a way for people to network, LinkedIn wants to tap into its user base to help people figure out where to go to college. The newly launched University Pages lets users type in the name of the school they're considering. LinkedIn will return a trove of data on the university in question. Much of this data is powered by LinkedIn's user base of 200 million. 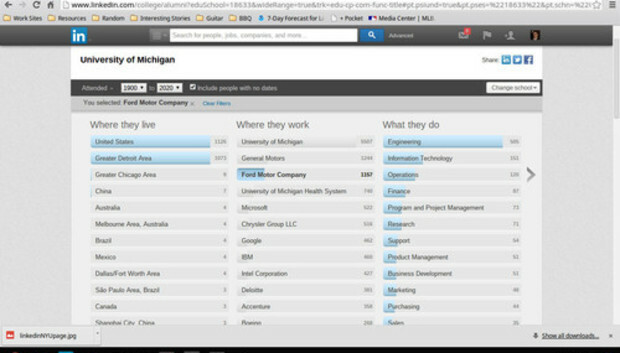 Just below a cover image for the university, LinkedIn shows aggregate information on the school's alumni, including where they live, where they work and what industries they're employed in. Clicking on any of these sections shows a list of alumni from the school, with links to their profiles on LinkedIn. Users can also look up basic information about the school, such as contact information, the number of students, graduation rates, student-to-faculty ratio and tuition rates. A sidebar on the page shows notable alumni, people you know with connections to the university and a list of similar schools. LinkedIn also hopes these pages will help connect alumni to each other, and to help employers recruit recent graduates. Employers will be able to come up with ideal candidates and advertise jobs to students who fit the bill. It seems like a helpful way to get some basic information about the university, though it'd be nice if LinkedIn let prospective students sift through the data in more advanced ways. For instance, you can't find out how many students on LinkedIn land a job right after graduation. There's also one noteworthy terms of service change LinkedIn had to make for this feature: In the United States and several other countries, the minimum age for the site is now 14, which allows high school students to connect with college students and alumni. By default, minors' profiles do not appear in search engine results, their last names and birthdates aren't shown, and their photos will only be visible to first-degree connections. LinkedIn also says it will show links to safety and privacy information on minors' pages. At the moment, LinkedIn says it has pages for 200 universities, but it will be adding "thousands more schools" over the next few weeks.